Achieving Work-Life Balance: Productivity | Vickery and Co. I remember the day it all came crashing down. Clients were lined up out the door (this is a good problem, of course, but I was at max capacity and something had to give) and all I could do was scroll through Facebook. I was working hard but I was not working smart. I was in desperate need of some systems that would help me mobilize my productivity. Time spent in an unproductive manner just causes frustration and a backlog of work and responsibilities. I cannot tell you the countless days I spent feeling so far in the weeds that I had no idea when I would ever get out. There is always so much work to do! During those times it was all I could do to get client needs met, never mind working on my business – – I was drowning working in it! This is no way to live and it is certainly no way to run a successful business. Productivity. Sometimes this feels like a buzzword in the entrepreneurial community but it makes all the difference in the number of hours spent working on and in your business. 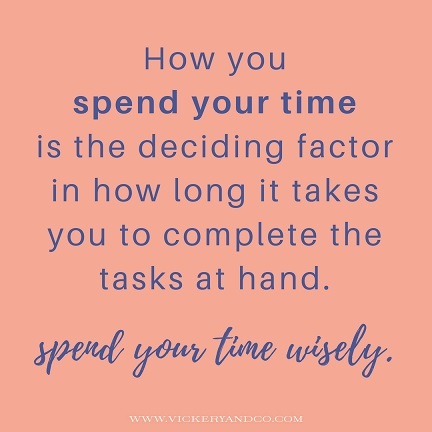 How you spend your time is the deciding factor in how long it takes you to complete the tasks at hand. In the Vickery & Co Entrepreneur Survey, we discovered that 58% of those surveyed say they spend all of their time working in their business rather than on their business. Now you have identified your needs and what you want your balance to look like. 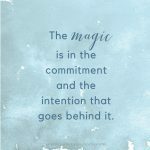 You’ve also defined and created boundaries to help you achieve the balance you desire. Now it is time to put productivity systems in place to get further into action and begin your journey to balance! At this point, I want to remind you that you do not need to do anything in your life or business. Remember to always find the want behind the need. If you start with the want, these new systems you are building will be much easier to implement and manage. Set aside time in the morning for meditation and self-reflection. If you do this at the start of your day, your head will be more firmly in the game. Eat the frog! Do the things you need to do, but may not really want to do, first. This frees your energy fields up and stops you from avoiding things. It also means everything else feels like a total win for the day. STOP multitasking and START batch tasking. This does not mean you cannot have multiple projects going on at once. It simply means you only focus on one thing at a time. No more checking email while on a phone call or scrolling through Facebook when you are working on a specific project or writing next week’s blog post. In fact, I would venture to say if you tracked your time for a week you would be shocked at how much time you spend not staying focused! Pick up the phone. Sometimes having a five-minute phone call can get the answers that you or a client needs right away without a day’s worth of email back and forth. Schedule out your day. Trust me, just do it. In most cases, it does not matter what task is first but having a schedule to tell you where to begin means you are spending less time in overwhelm and chaos. Keep your to-do list to no more than 6 items. When we have a list that is three pages long it feels so heavy and unachievable. Pick the most important six things for each day and get them done! If you have time leftover, start on a new six. The idea here is to take action, be productive and feel accomplished at the end of the day. Know when you don’t know something and outsource! Your time is best spent not spinning your wheels. Know when you should bring in an expert. Utilize the amazing productivity apps and plugins available. What you use doesn’t matter tremendously so long as you are utilizing some. We all work in different ways, and that is why there are so many apps which work better for different people! Utilize the rewards system. If I complete an hour’s worth of writing I will take a walk and grab a fancy coffee. Or upon completion of a major project, I will treat myself to a day at the spa. The rewards can be small or large as long as they motivate you! These are just a small sampling of tools to manage your time. Implement these systems or design your own — but I promise that doing so will allow you to discover there are simply more hours in the day. Another amazing side effect will be happier clients because when you are focused, your clients get the best of what you have to offer! Have some productivity methods that you love? I’d love to hear about them. Shoot me an email or leave a message on Facebook, Twitter or Instagram. The more we know and share, the better off we all are. I love hearing from you!